I ducked out of reviewing the previous issue, but I was here for the start of the "Out of Time" story back in #698. I thought #699 was a bold development, zipping straight past the clear "victory" point and ambitiously setting the stage for a "what happens next" story. And #700 delivers that story. It's good. It asks some thoughtful questions, poses significant challenges to Cap, and eventually allows him to do some stand-up last-ditch heroism of the sort that's guaranteed to elicit emotional cheers. It also gives Mark Waid another swing at writing some "add this to your Cap shield tattoo"-great lines that encapsulate Captain America's attitude. Those lines do come out great, and they are downright tattoo-worthy, so this comic is a long way from "I regret reading it" territory. But there was clearly a decision made to condense this storyline so that it would wrap at the big round number, and that creates a few missed opportunities. This becomes a storytelling problem in this issue's final showdown between Cap and Babbington, where poor Steve is forced to spit up clumsy expository dialogue so that we can understand exactly how Rampart's "Atomic Holocaust" plan was supposed to work and what its unintended consequences were. While that clarification is appreciated, as scripted, it bleeds off a bit of the beautiful tension Mr. Waid is building through the final act. Basically, this story arc needed another issue, probably between #698 and #699, to do more world-building in a more organic way. Though I'm arguing that the arc has some significant pacing problems, in terms of scene-to-scene flow, this issue is practically perfect. As foreshadowed in #699, we get to see Cap struggle to lead the New America both from the throne and on the battlefield. The way that onerous burden wears on him is spectacular, grinding him down to a dark point where he utters what Bruce Banner rightly calls "the least Captain America thing I've ever heard." Does he get a chance to redeem that utterance in word and deed? Is he still Captain America? Of course he does and of course he is! The finale is, except for the exposition blip mentioned above, deliciously powerful. Chris Samnee does not short us on amazing Cap action anywhere in #700. There are busy set-piece field battles at the start, and the conclusion delivers spectacular acrobatics and memorable shield-slinging. And there are plenty of visual delights in between, like the Kirbytronic time travel gizmos Bruce Banner is sticking around to build. Aside - It's a pity Mr. Waid couldn't find a proper role for Ben Grimm in this script. After his powerful appearance in #699, it would have been nice to see him return as more than a voice on a radio. 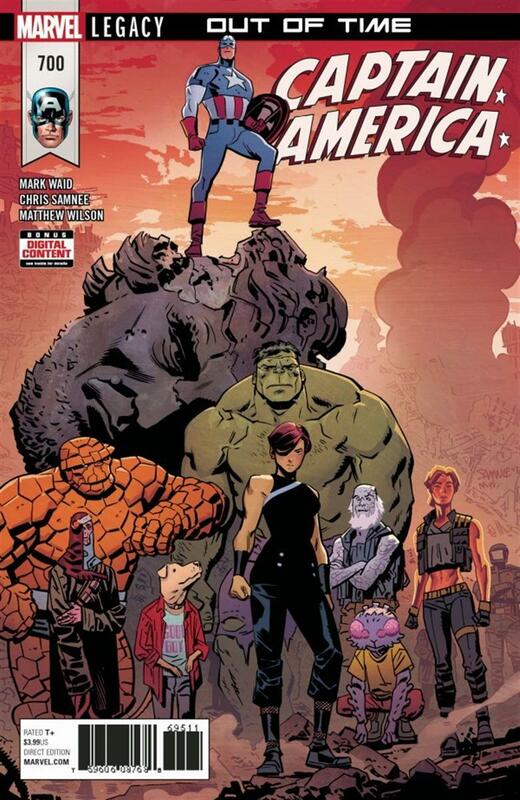 Matthew Wilson's colour work is one of the other places where Captain America #700 is ever-so-slightly disappointing. He sticks with a muddy palette that suits the desolate post-apocalyptic setting, but he leaves the saturation down in the mud until after the day has been saved. This leaves the climax itself - an apocalyptically fiery scene - to be rendered in shades of fuschia that I found fundamentally unappealing. The near-monochrome treatment was skillfully done - if only the "chrome" was a different "mono!" Bulking up the book and justifying its six-dollar price tag, we get an interesting little bonus: An all-new backup story cobbled together from snippets of original Jack Kirby art given a new plot by Mark Waid. It's a cute exercise. It lovingly replicates the sometimes-scattershot way Stan Lee's scripts and Jack Kirby's art could diverge like compass legs and drag the reader to a completely unexpected - but not disappointing - ending. A mention of "Master Sergeant Grimm" suggests an interesting/petty continuity question: Thanks to the sliding timescale, Ben Grimm probably isn't a USMC vet anymore, huh? Wotta revoltin' loss for the Corps!